Our first glimpse of the car was the top-of-the-line Model Signature Series, shown here. The interior is trimmed in rich-looking wood and brushed metal. There are no gauges or knobs here. Both the instrument panel and the so-called "center stack" -- the place where you normally find climate and entertainment controls -- have been replaced by computer screens. The center screen is, almost literally, a built-in iPad. With it, the driver can, of course, control the car's stereo and air conditioning. (In homage to the movie "Spinal Tap," the stereo volume can be turned up to 11.) But the driver can also check email and surf the Web. And, yes, the driver can do that while driving. 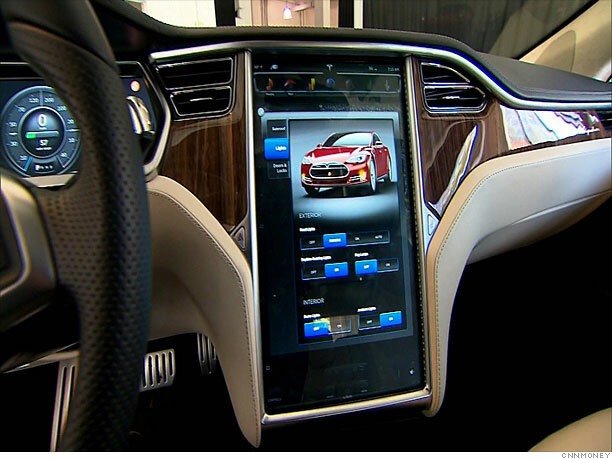 Sophisticated voice controls should keep the driver from needing to look down at the screen, Tesla CEO Elon Musk said, but there's nothing preventing it either. "We believe in leaving it to people's discretion as to what they want to do when," he said. However, there are some legal restrictions on placing video screens within view of the driver. That means some functions -- like the ability to watch "Annoying Orange" while on the freeway -- may need to be blocked, whether Musk likes it or not.